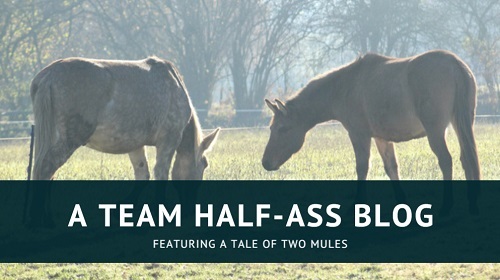 One of the (many) things I find interesting about the mule is his position in herd hierarchy. He is not at the top of the pecking order, nor is he at the bottom; he’s not even in the middle. As far as I can tell, he has a set of rules purely applicable to him. When food is introduced, he does not have the required status to keep the horses off his pile of hay or his patch of grass, and he will never push them off theirs either. However, although he will calmly consent to being moved on, he doesn’t keep clear – he will brazenly return and try again, and again, always friendly, until he gets what he wants. And the weird thing is that the horses often let him! Last night, I watched him try to steal Iris’ dinner. He’d finished his and, as I was dawdling when it came to putting hay out, he decided that he would have to fill his poor empty tummy with the contents of the nearest feed bowl instead. He approached steadily, nose low, ears pricked right forward, each footfall deliberate. Iris pinned her ears at him and showed him her teeth, and he stopped; then, when she was eating again, he continued. He touched the edge of the food bowl with his top lip, and she pinned her ears at him again, so he stopped. She continued eating, and he tilted his head slightly, ears still pricked, dipped his nose carefully into the bowl, and drew it towards him. It was me who told him to clear off, not Iris. 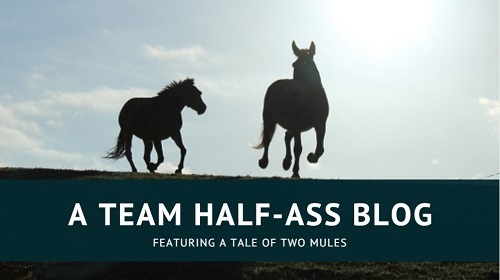 She is not a mare to shy away from showing someone her back end – indeed, she went after poor Cash shortly afterwards – and yet despite the fact that she clearly didn’t want to share her dinner, and despite the fact that she is herd matriarch and does not have to do anything the mule says, she still gave in to him. This is how it always happens, and I would love to know why: is his cheerful persistence just so annoying that the horses let him do what he wants because it’s too much hassle to keep grumping at him? Do they have an indulgent kind of affection for this irritating, odd-looking fieldmate of theirs? Did he roll a natural twenty on charisma? Quite often, I arrive to find them grazing separately: horses together, mule on the other side of the field – but apparently quite happy with his solitude. He is equally happy to be standing with them, and he certainly seeks out their company when he doesn’t want to be caught. He loves getting scratchies, but we have only once seen him engage in mutual grooming. He is not herd bound, and walks out without hesitation when I take him off property. 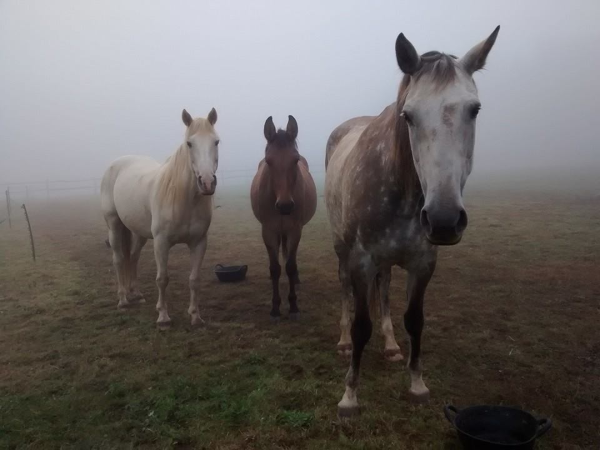 But if I take the horses away, he will call for them until they return. A herd of horses galloping along the fence-line beside him does not get him excited (he barely even acknowledges them), and yet the sighting of a single feral pony in the Punchbowl fills his entire world. 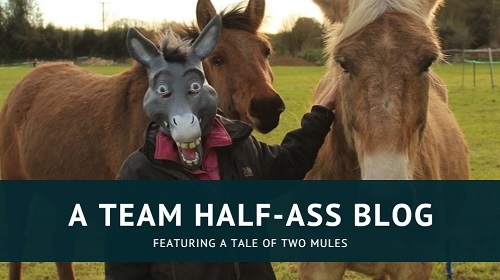 I think the explanation to all this is that mules are quite self-centered; or at least, my one is. He has his own rules. He’s also pretty confident of his position in life. If he comes up against something that doesn’t fit in with his world-revolves-around-me view, then he can be diplomatic; but he doesn’t see why he should have to change his goals or accept the customs of others. So really, persuading him to agree with anything I want to do is a much bigger deal than it might seem.